Listen to "#GIRLBOSS" on your iOS and Android device. 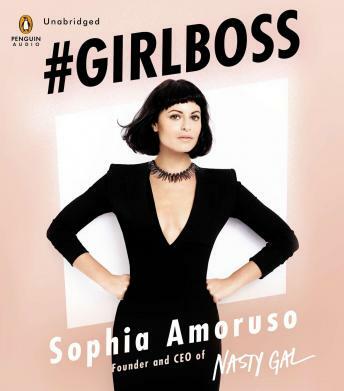 In the New York Times bestseller that the Washington Post called 'Lean In for misfits,' Sophia Amoruso shares how she went from dumpster diving to founding one of the fastest-growing retailers in the world. Sophia Amoruso spent her teens hitchhiking, committing petty theft, and scrounging in dumpsters for leftover bagels. By age twenty-two she had dropped out of school, and was broke, directionless, and checking IDs in the lobby of an art school—a job she’d taken for the health insurance. It was in that lobby that Sophia decided to start selling vintage clothes on eBay. Flash forward ten years to today, and she’s the founder and executive chairman of Nasty Gal, a $250-million-plus fashion retailer with more than four hundred employees. Sophia was never a typical CEO, or a typical anything, and she’s written #GIRLBOSS for other girls like her: outsiders (and insiders) seeking a unique path to success, even when that path is windy as all hell and lined with naysayers. Very good book ,but I felt rushed at some parts and then got a little anoid. over all there was a lot of information in this book and fun to listen to. Excellent book. I now know what all the hype has been about. #GIRLBOSS rocks!!! Really liked the book. Inspiring and motivating! Made me smile a lot. But I do agree that it was repetitive at times, which was annoying. Great for Personal Development! Very Down to Earth and great points for those just starting out! If you're looking for an autobiography filled with humble brags and small bits of business advice that you've heard before, this is for you. I was really looking forward to this book and expected it would motivate me as I open my first business, but instead I felt as though Sofia was talking down to her readers and putting herself up on a pedestal of perfection. She seems to expect extreme amounts of education and experience from her staff, even though she herself had none. The good news is she did teach me to work on being more self aware to ensure I never come off the way she does. Such an amazing book! it's a great learning tool for those that want to start running their own business. Girl or Boy! Definitely recommend reading it! I enjoyed listening. I thought her story to success was very interesting. Very repetitive at times but overall very motivational. I finished this book in one day!!! It was really good obviously I couldn't put it down. Definitely want my daughter to read this when she becomes a teen. Must read!!! Even if u aren't planning on starting a biz, a lady can definitely take something from this book!????????????????????????????????? ?